Mish's Global Economic Trend Analysis: Will Quantitative Easing Spur Inflation? Job Creation? Credit Expansion? Do Anything? Will Quantitative Easing Spur Inflation? Job Creation? Credit Expansion? Do Anything? St. Louis Fed James Bullard's proposal to start "quantitative easing" is creating a stir. Chris Ciovacco at Ciovacco Capital Management (and many others) propose the Fed can and will use quantitative easing to induce inflation. I disagree. The following are snips from Chris Ciovacco's article, Reading Between The Lines: James Bullard’s Seven Faces of “The Peril” followed by my point-by-point replies. The titles in "bold red" below are questions Chris Ciovacco proposed and answered. My answers are quite different. What could all this mean to me and my investments? Chris Ciovacco: Let’s start with quantitative easing, where the Federal Reserve buys Treasury bonds. Using a hypothetical example to illustrate the basic concepts, assume a typical American citizen has some Treasury Bond certificates in a shoebox under their bed. If the Fed offers to buy those bonds, they will be exchanging paper money, not currently in circulation, for a bond certificate. After the transaction, the American citizen has newly printed money and the Fed now has a bond certificate. It is easy to see in this example the Fed has increased the money supply by buying the bonds. The Treasury Bond represents an IOU from the U.S. Government. 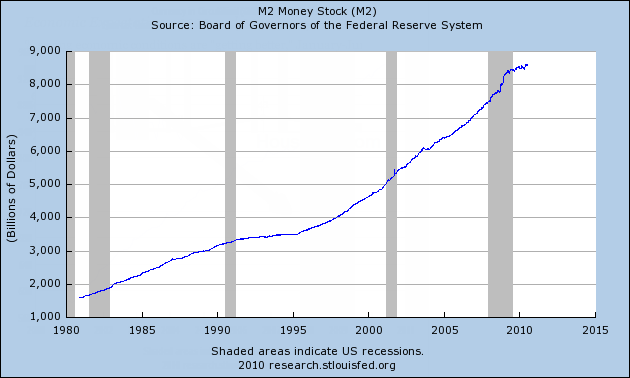 When the Fed buys bonds in the open market, it is like the government buying back its own IOU with newly created money. This is about as close to pure money printing as it gets. Mish: The typical American citizen does not have Treasury Bond certificates in a shoebox, under their bed, or anywhere else. Those who do have treasury bonds, more than likely have them in a mutual fund portfolio or treasury EFF and they probably do not even realize they have them. The very few who hold treasury bonds outright, are highly unlikely to sell them. How is this policy any different from lowering interest rates or increasing bank reserves? Chris Ciovacco: Lowering interest rates and flooding the banking system with cash has one major drawback; if the banks won’t issue loans or customers do not want to take out loans, the low rates and excess bank reserves do little to expand the supply of money in the real economy. Therefore, these policies can fall into the "pushing on a rope" category. Quantitative easing, or Fed purchases of Treasury bonds, injects cash directly into the real economy, which is a significant difference. Mish: Currency in circulation is a factor of demographics, population growth, wage growth, the size of the underground economy, access to credit, and people's willingness to use credit vs. cash. If people do not want to (or can't) hold more money in their wallets, they won't, regardless of what the Fed does. People are not going to hold more cash if they sell their treasury bonds. Of course they are not going to sell their treasury bonds because they do not have them in the first place as noted above. Those are all deflationary phenomena. However, the main reasons cash in circulation rises over time are population demographics and wage growth. There are more people and the collective sum of cash people keep in their pockets increases as a result. How could all this create inflation and why should I care? Chris Ciovacco: In a simple hypothetical example, assume we could keep the amount of goods and services available in the economy constant for one year. During that year, the Fed buys enough Treasuries to exactly double the dollar bills in circulation. The laws of supply and demand say if we hold supply constant (goods and services) and double demand (dollars chasing those good and services), prices will theoretically double. Obviously, if the prices of all goods and services doubled, the purchasing power of your current dollars in hand would be cut in half. This is known as purchasing power risk. Mish: The Fed can and will supply demand for cash (especially seasonally, think Christmas). However, the Fed cannot control the demand for cash as Ciovacco maintains. Furthermore, Ciovacco is simply mistaken, in theory and practice that increased money in circulation necessarily means prices will rise. 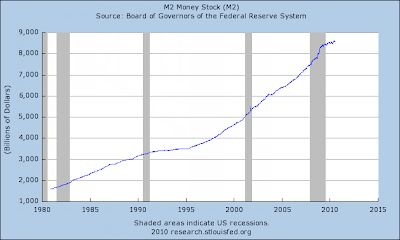 Let's look at this in terms of money supply alone. Currency in circulation (as well as money in checking accounts) is dwarfed by M2 and Total Bank Credit. 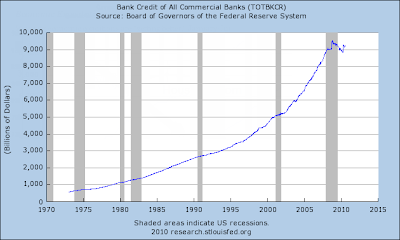 There is $940 Billion dollars in circulation compared to $8,500 Billion of M2 compared to $9,300 or so in total bank credit. 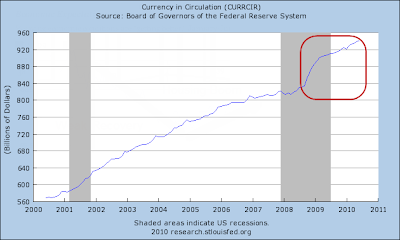 If currency in circulation doubled, would prices double all other thing constant? Heck would prices even rise? What prices? In spite of an unprecedented increase in currency starting mid-recession, the CPI fell. Let's pick another time slot. Since the beginning of 2006 there was a 20% increase in currency in circulation and home prices collapsed as did the stock market. That collapse in asset prices wiped out trillions of dollars of imagined wealth. Thus, sometimes prices rise when currency in circulation goes up, sometimes not. Clearly there are other forces in play. What are those forces? If consumers do not want to spend, and businesses do not want to expand, there is not a damn thing the Fed can do about it. Those who think quantitative easing increases prices of goods, services and the stock market should also take a look at Japan's results over the past two decades. If the Fed starts buying bonds what could happen? Chris Ciovacco: Since the Fed would be devaluing the paper currency in circulation, market participants would most likely wish to store their wealth in other assets, such as gold, silver, oil, copper, stocks, real estate, etc. The mere announcement of such a program would begin to accomplish the Fed’s objective of creating an expectation of higher future inflation. The expectation of future inflation can lead to asset purchases and investing, which in theory creates inflation by driving the prices of goods, services, and assets higher. In fact, the creation of this document and your reading of it assist in the process of creating increased expectations of future inflation, which is exactly what the Fed is trying to accomplish. Mish: Ciovacco keeps piling error upon error. Except in periods of hyperinflation where there is a complete lack of faith in currency, this whole idea of inflation expectations is potty. People might move demand forward a bit, but they cannot store oil, nor will they buy a computer or more food simply because prices are going up. If you have enough shoes to fill a closet will you buy more? Hells bells, $8,000 tax credits did next to nothing for housing demand? Would $16,000 credits work? By the way, note that those tax credits came from Congress, not the Fed. The Fed has no means to give money away. The Fed can lend, and the Fed can swap good assets for bad with banks, but there is an implied swap back at some point. More importantly, and unlike Congress, the Fed cannot give money to consumers, and consumers are the problem. Thus, the idea that the Fed can increase inflation expectations, and those expectations will result in actual consumer price increases is silly. If that is all it took, they would have done it long ago. By the way, didn't the Fed already try? And Fail? 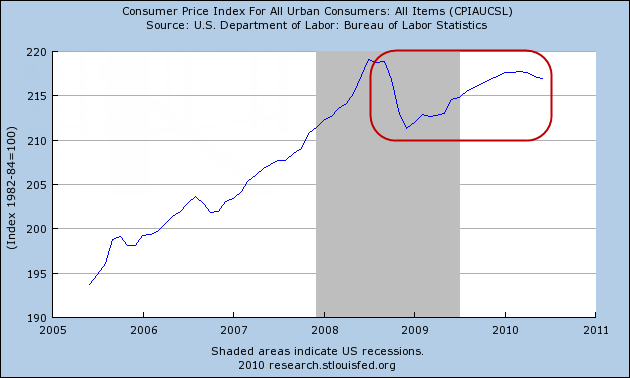 Please see Are we "Trending Towards Deflation" or in It? Chris Ciovacco: Mr. Bullard hypothesizes the current economy may need rising inflation expectations to come first, which in turn would help create actual inflation since it would influence the buying and investing habits of both consumers and businesses. If you feel the Fed will “do whatever it takes” to create inflation, you may decide you need to protect yourself from inflation by investing in hard assets, like silver and copper. Your purchases of hard assets would help drive their prices higher. The mere perception of the possible devaluation of a paper currency can change the buying and investing patterns of both consumers and businesses. Mish: For a change, let's assume that Ciovacco is correct. Suppose, the Fed increases inflation expectations and the price of gold, silver, and oil rises. That can happen actually, not necessarily because of "expectations" but as a result of Fed sponsored liquidity seeking a home. However, a rising price of gold or oil is not what the Fed really wants! The Fed is interested in bank credit, lending, and jobs, not the price of gold or commodities per se. The Fed is especially interested in credit expansion because that is what it takes to create jobs. In a fiat-based credit society, a collapse in credit is deflation. Please see Fiat World Mathematical Model for a discussion of money vs. credit in the fiat world. Given that gold has no significant industrial use, the Fed does not care one iota about the price of it. However, the Fed does care about oil and copper. Rising oil prices without an increase in jobs or genuine business activity would certainly add to consumer stress, increase defaults and lead to a further collapse in credit (just as happened in summer of 2008 when oil rose to $140 on speculation alone). This fact that the Fed can print but not dictate where the money goes (or even if it goes anywhere at all) creates an enormous, if not insolvable problem for the Fed. Because the Fed cannot target money supply other than support housing by purchasing agencies (and that did not work did it?) the Fed might be more reluctant to try quantitative easing than Bullard sounds. Is this the Bullard Bluff? The question is moot because quantitative easing would not accomplish what the Fed wants or what others think it would do except perhaps in some initial fashion that fades away, just as the effect of prohibiting the shorting of financials did. No doubt some will respond that the Fed will keep at quantitative easing until it works. However, pushing on a string with 10 times the thrust won't do much of anything but increase the Fed's exit problem down the road. The Fed already does not know what to do with a trillion dollars worth of Fannie and Freddie assets. What would it do with a trillion more? The Fed is powerless at this point. It has no means of creating jobs. It can offer credit but it cannot force consumers and businesses to take it. The Fed can put money into banks, but it cannot make them lend. Some have argued the Fed can force banks to lend to by charging interest on excessive reserves. 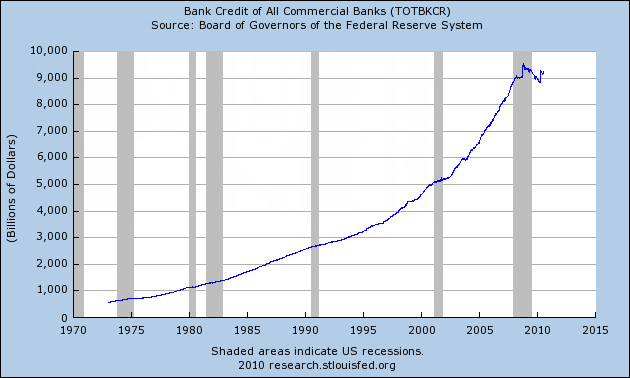 I suggest banks would simply take excess reserves and put them in treasuries at 0% in response. Actually if it came to that, the Fed would spook the market with such actions. Think Wall Street would react kindly to forced bank lending? I don't. The stock market would probably collapse. Thus, all of these nice sounding "solutions" that people propose are all flawed. The key to understanding those flaws is fourfold. Careful analysis suggests that quantitative easing is no more likely to spur job creation, bank lending, and consumer spending in the US than it did in Japan (which is to say not at all). 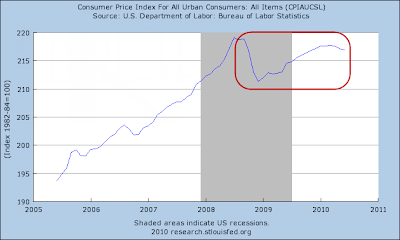 It is bank lending, job creation, and consumer spending the Fed is after, not a rise in the CPI or commodity prices. The real threat of inflation is not the Fed, but Congress. Congress, unlike the Fed, can give money away. However, we will have a new Congress next year, and even this Congress is tired of stimulus efforts. The next Congress is likely to be far more conservative. Congress will give money away of course, but in amounts big enough to matter? The trillions so far did not matter. The reason is credit dwarfs money supply and consumers are struggling to pay down credit. All things considered, odds of significant inflation are seriously overestimated by all but a handful of deflationists who understand the role of credit in a fiat-based credit economy and the Fed's inability to do anything about consumer attitudes towards spending.